If my body is a temple you can worship at my feet, but it might kick you in the teeth some, so even when you’re spitting blood you would save a thought for me. It’s official: today is the final day of Band of the Day app. Since September 2011, we’ve had the pleasure of exposing one new amazing artist a day, every single day, to some of the most passionate music aficionados out there. The decision to shut down the app didn’t come lightly, but we’re excited to put 100% company focus on our fan club ticketing and data analytics platform, Applauze. Nevertheless, we wanted to go out on a high note with Band of the Day by featuring one of our absolute favorite bands of the past few years, The Vaccines (band #1420 to be precise). Back in early 2011, before Band of the Day app even existed, I was given a task as part of my application to become the company’s first music editor. That task was to choose an up-and-coming band that I was excited about, and write up a brief review of their music. The band? You guessed it, The Vaccines. At the time, the London-based band only had one EP under their belts, but they were already making waves in the vast ocean of the indie music scene. As I wrote in my review back then, “when a band manages to sell out concerts before even releasing a full-length album, it’s hard not to pay attention.” I ended up landing the job, and one of my first goals was to make The Vaccines the app’s very first featured band. Unfortunately at the time, as an unestablished app, and due to complicated licensing agreements around legally streaming music to a worldwide audience, we were not able to get approval from their record label to run the feature. Still, as the band went on to release their next two albums, What Did You Expect From The Vaccines? (2011) and Come Of Age (2012), we continued to enjoy blasting their music in the office. Few modern British guitar bands have had such an instant impact as The Vaccines. Emerging in the summer of 2010 with blend of retro surf punk, Ramones guitars and Everly Brothers pop hooks, their high octane, ultra-melodic sound saw them instantly adopted as the hot new guitar band on the block. The London four-piece – Justin Hayward-Young (vocals/guitar), Freddie Cowan (guitar), Arni Arnason (bass) and Pete Robertson (drums) had only formed in early 2010, but in early 2011, debut album What Did You Expect From The Vaccines? Quickly achieved platinum status. Just 18 months later, the follow-up, Come Of Age, hit Number One. It was a mercurial rise, not least because guitar pop was unfashionable at the time and Young had previously been a struggling singer-songwriter. Under the monicker Jay Jay Pistolet, he’d hauled himself up and down the motorway to small audiences before forming The Vaccines and writing the songs that changed the game. Indeed, and Young vividly remembers playing the tents at Reading and Leeds festivals in summer 2011 and fretting that no one would be there. That was then. The last four years have seen them travel the world, play arenas, and experience the pop dream “way beyond what we ever imagined.” However, the ever confident but self-critical Young felt unfulfilled. Thus The Vaccines’ game-changing third album, English Graffiti, in which they tear up the plans and see what happens as they fall around them. 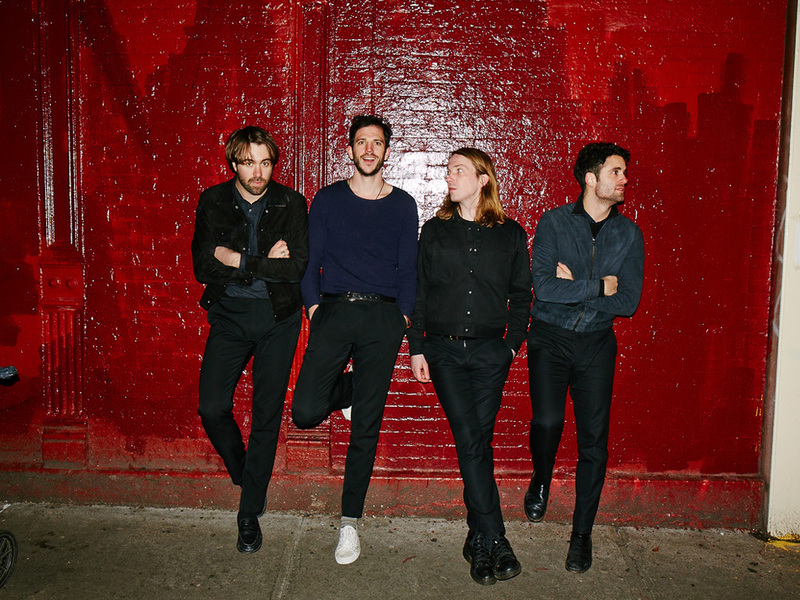 The elements of the old Vaccines sound remain – certainly in the buzzsaw pop rushes of Handsome, 20/20 and Radio Bikini – but their sonic palette is completely different. An eclectic and surprising adventurous musical mix with songs that acknowledge the Eighties pop of ELO and Duran Duran, while sounding firmly of the now. The new sound has been achieved by first stockpiling over 50 songs – Young writes every day – and then working on the best in an upstate New York studio with Flaming Lips producer Dave Fridmann and Cole MGN, whose name is synonymous with sample-based pop and R&B, not guitar rock. While making the record, The Clash’s Combat Rock was a studio favourite. The ideal was to follow a similar trajectory as that band, who’d started off “rough and ready” but evolved into something nobody had expected. Similarly, Young wanted to embrace modernity and what is going on around us in the world.” As artists, this meant scrapping songs, remoulding songs, and at one point scrapping a previous version of the album, but it all felt liberating and exciting. “That really came to the fore because of conversations I was having with friends,” explains Young, who reveals that the title was informed by seeing graffiti written in English, all over the globe. “I love technology, but you can go to a bar in Peru or China or anywhere in the world and everyone’s wearing the same shirt and listening to the same music and drinking the same beer. These sort of dystopian themes emerge particularly on songs such as Minimal Affection or the funky Want You So Bad. Songs such as (All Afternoon) In Love may particularly throw people who thought they knew what to expect from The Vaccines: it’s otherworldly, gossamer, melancholy pop in the mould of 10cc’s classic, I’m Not In Love. Radio Bikini’s title had been in Young’s diary for some time before he started playing around with combining a song that was ostensibly about the summer, but also about the bombing of Bikini Atoll in Vietnam – a nod to the Dead Kennedy’s punk classic, Holiday In Cambodia. These are some of the best songs of the Vaccines’ career, none better than Dream Lover, which nods to the Bobby Darin and Mariah Carey songs with the same title, but allies a hallucinatory atmosphere and lyric about an imaginary partner with a killer riff. Another dreamy monster is Gimme A Sign, the last song written for the album, which found Young found himself chuckling at the pop hugeness of the chorus, which in a way brought him full circle, back to that day he penned If You Wanna.